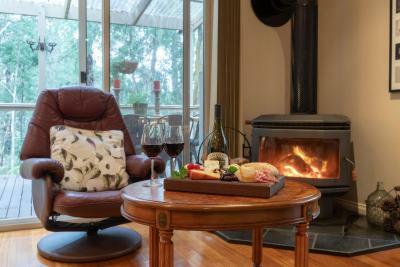 Lock in a great price for Myers Creek Cascades Luxury Cottages – rated 9.4 by recent guests! Everything. It was beautifully located. Nature all around. Very peaceful. A wonderful place to unwind. The in house spa-bath next to windows overlooking the forest was amazing. All facilities including bbq grill were very good. Great attention to detail both in terms of interior and the surroundings. Very accommodating staff, also great deal of privacy. In-house fire place makes the cottage very cosy. We liked everything, one of the best places we ever stayed. My partner and I came here for the weekend during winter and I can honestly say we wouldn't change a thing. We had an absolutely magnificent stay here. It was just what we needed to unwind and relax. From the music playing as we entered the cottage to the water feature and stunning views outside the windows by the hot tub in our secluded cottage to the wonderful service provided by the fantastic hosts, the entire atmosphere was quite serene and we couldn't have been more relaxed. Will definitely be coming back! Everything. Especially views. Great place for spa treatment. So excited to be here. Will come back. Strongly recommended! The location. Beautiful scenery and Mandy was super lovely. The spa and bed were amazing!! The surroundings were epic. The attention to detail, the comfort and ambiance with the beautiful rainforest surroundings made it an ultimate getaway. A friendly and welcoming introduction on arrival. 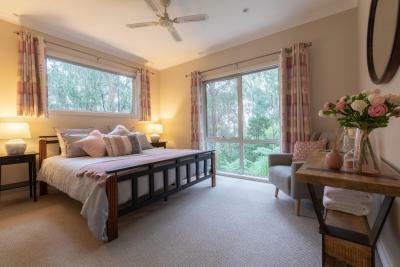 The unit was very clean and well appointed with an isolation from other guests that provides a real privacy that is also respected by the owners. 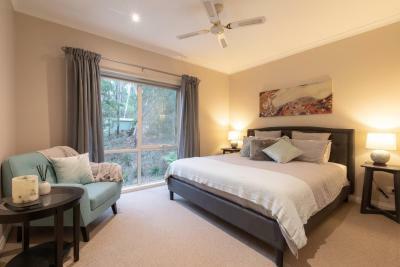 Myers Creek Cascades Luxury Cottages This rating is a reflection of how the property compares to the industry standard when it comes to price, facilities and services available. It's based on a self-evaluation by the property. Use this rating to help choose your stay! 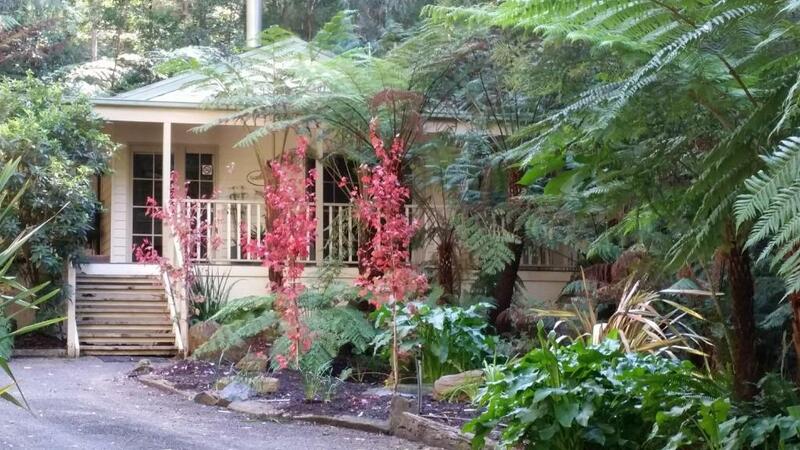 A private rainforest hideaway awaits you at Myers Creek Cascades Luxury Cottages. Whether you’re relaxing with a glass of wine on the patio, or soaking in the 2-person spa bath the beautiful views will amaze you. 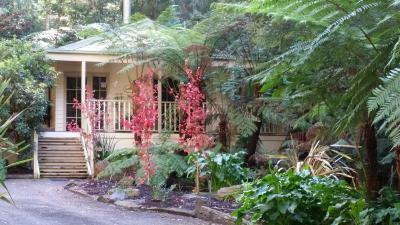 Myers Creek Cascades Cottages is a 5-minute drive from Healesville and a 10-minute drive from Healesville Sanctuary. Domaine Chandon winery is a 15-minute drive. 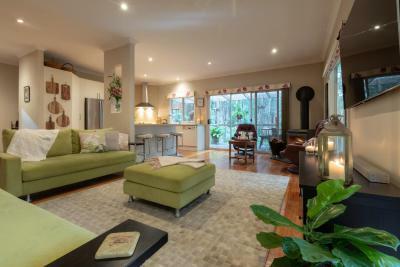 The luxurious cottages feature a lounge room complete with a cozy fireplace. 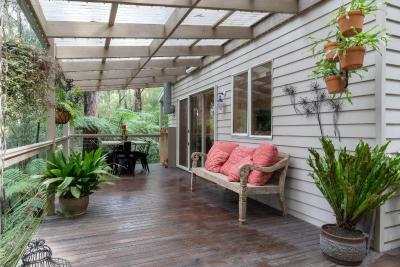 There are also indoor/outdoor dining areas and a fully equipped kitchen. Treat yourself to an in-room massage, or book a local activity through the tour desk. There are also BBQ facilities. 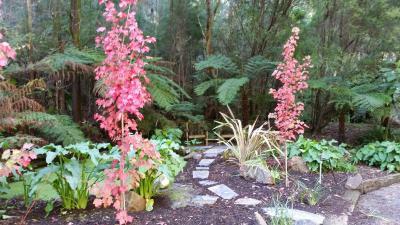 When would you like to stay at Myers Creek Cascades Luxury Cottages? 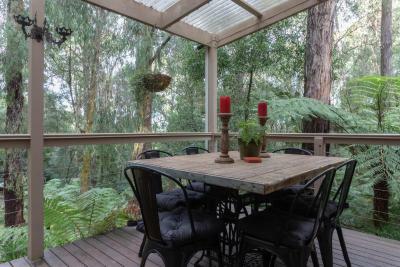 This cottage features a patio with rainforest views. You can also enjoy these from the comfort of the 2-person spa bath. 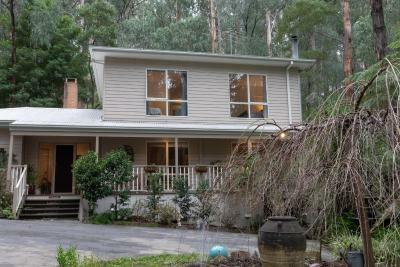 It features a lounge room complete with a cozy fireplace. 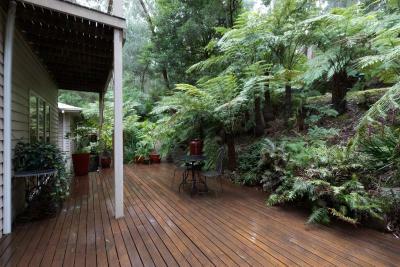 There are also indoor/outdoor dining areas and a fully equipped kitchen. MYERS CREEK CASCADES - the ultimate in luxury cottages for couples Winner of the Traveller’s Choice Award at the 2014,Winner of 2015 certificate of Excellence. 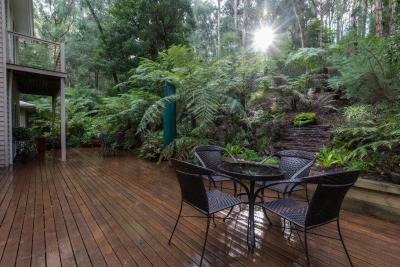 These four romantic and unique self-contained cottages at Myers Creek Cascades are individually designed to embrace their exclusive location – hidden gems set in the heart of a spectacular eucalypt forest. Step into your own secluded hideaway and experience the ultimate bed & breakfast experience. It’s the luxurious solitude and the attention to detail that makes Myers Creek Cascades Luxury Cottages an amazing getaway experience for that special celebration. 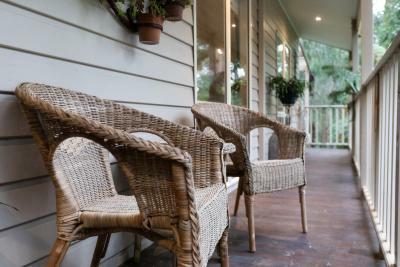 House Rules Myers Creek Cascades Luxury Cottages takes special requests – add in the next step! Myers Creek Cascades Luxury Cottages accepts these cards and reserves the right to temporarily hold an amount prior to arrival. The price was a bit exxy. I was expecting a cosy cottage not a massive 2bedroom apartment. I had hoped for the price at $350ish per night it would have come with breakfast supplies/ more of a bnb experience. There was fruit, coffee and tea. 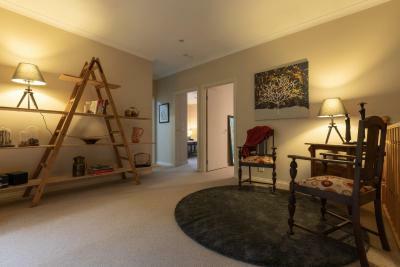 All the photos on the booking site showed cottages with a fireplace, but on arrival we noticed the wood heater was full of candles and there was no firewood. It was a cold weekend... we’d have loved to build a fire. Mandy the owner was lovely and welcoming. The bed. The spa. The deck. 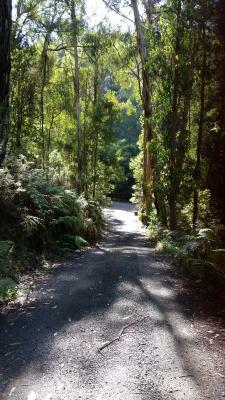 Wonderful setting in a great location to enjoy the Yarra Valley. We really enjoyed the cottage layout. The fireplace and hot-tub with a view ticks the boxes. 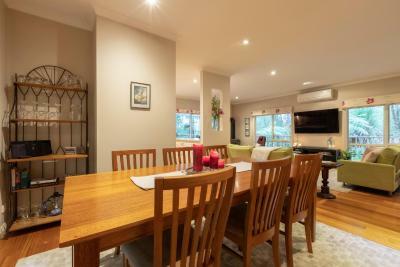 This could be improved, although not a minus - the booking says that breakfast is included and while we did find bread, some jams, vegemite, butter, fruit, muesli, milk, coffee, honey in the cottage, this was not topped up the next day of our stay (we stayed 2 nights). I felt uncomfortable calling and asking, so I didn't. It would have been nice to have some ham or cheese. On the other hand, they left some wine fee of charge, which was nice. Nothing. Everythinf was amazing . There was nothing I didn’t like, but I would have preferred the room was serviced while we were out for the day.